Once again thank you for all your good wishes and kind words for Mr E. I am delighted to say he came home on Monday , and we are both learning to adapt to the new reality. He is doing great. The weather has helped. We have been basking in glorious sunshine in North Yorkshire. Nature has gone into over drive. In the space of a week the frogs have laid spawn and we have tadpoles; bees and butterflies have reappeared, and I am told that swifts and swallows are here. I shall keep looking for them. Spirits have lifted. Mr B and Ms G are coming to lend me a hand this weekend. We may even figure out how to use scary new electric lawnmower, between the three of us. All new gadgets terrify me, especially if they can fuse the house soon as look at you. With spirits lifting the urge to create has returned. 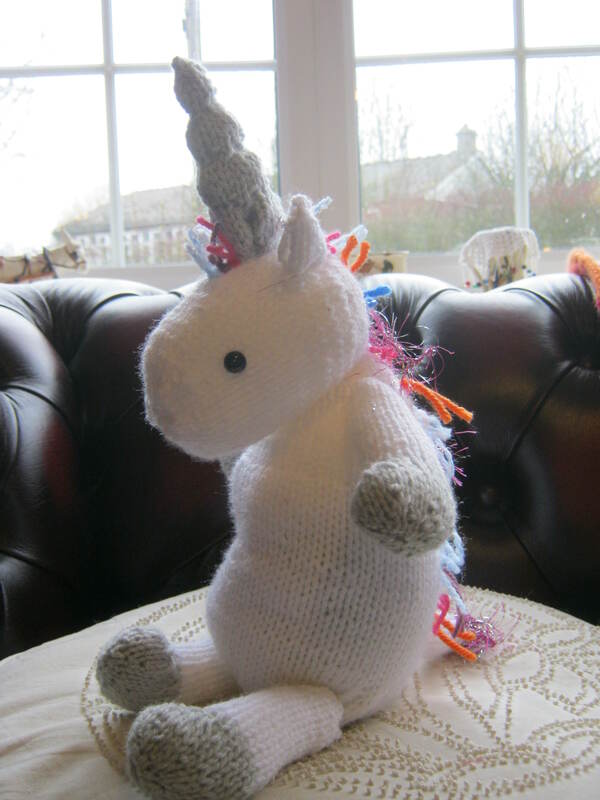 One Unicorn now on its way to Wiltshire. She wouldn’t tell me her name, she says she will whisper it to Little Miss F, who I am sure will be delighted with her as she only eats chocolate apparently. I suppose that’s what happens if you are made over Easter. 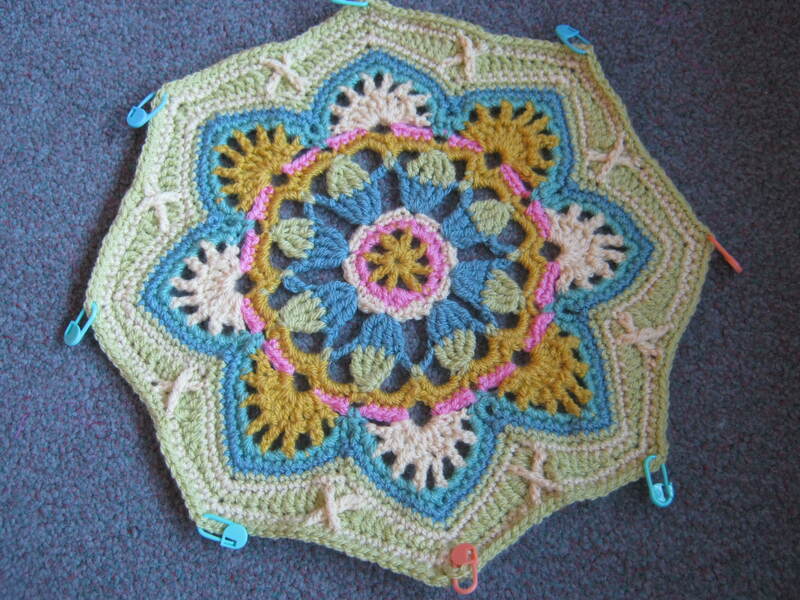 I completed the first tile for my blanket. Not at all certain I followed the instructions correctly for the cross over double trebles but heigh ho, who is going to know? I decided I better get a wriggle on with my WW1 sawdust heart. I decided I would cover it with a pillow cover type thingy, incredibly I did manage to follow the instructions for this. I spent a long time thinking about what I wanted to say with my heart. I remembered a few lines from a poem by Laurence Binyon entitled For the Fallen. This is the verse. I have previously made some felt of a sunset and done nothing with it. It seemed right to use this. I wanted the words remember me to be included within the sunset. However I think the effect is too subtle. 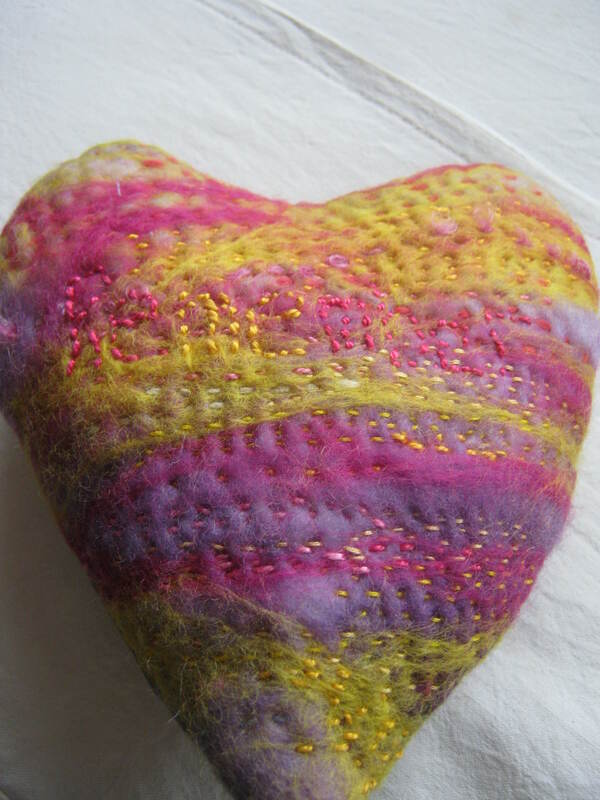 Now the point of sawdust hearts is that they are decorated by using sequins and beads pinned into the heart. Should I use seed beads to go over the letters do you think, or embroider the letters with a more contrasting thread. Thoughts and ideas please. I should add that I making this in memory of my Great Uncle from Liverpool who died in December 1917 of wounds. Finally I have been doing a little knitting, on my Sunday Scarf, which is asymmetrical and the pattern is just two lines long and is copyrighted by its owner on pain of something absolutely awful happening to me should I divulge how you make it this shape. 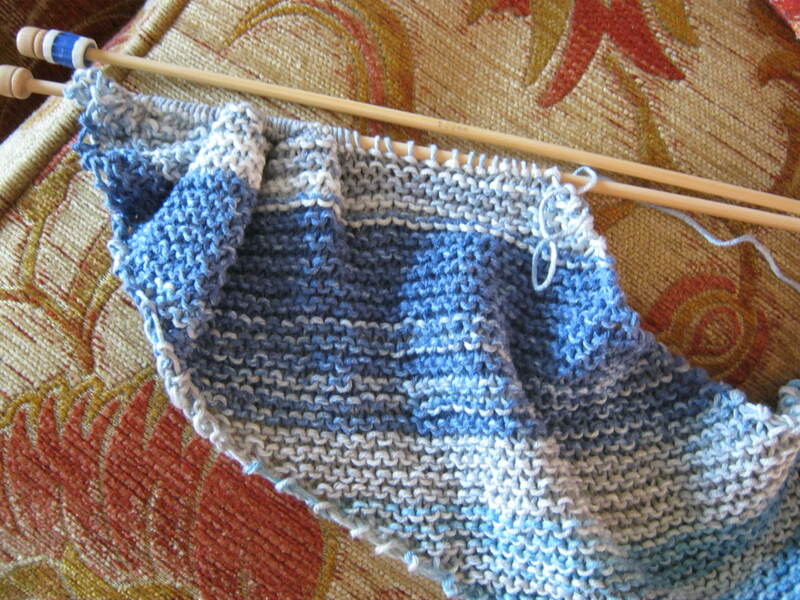 The best thing is I can knit this whilst being too tired for anything else. Hoping so much that this warm weather continues for a while, it makes everything feel just that little bit brighter.